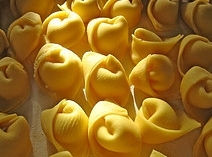 Homemade cappelletti pasta is easy to make and I will give you step-by-step directions. Easy authentic Italian recipes - all from scratch, and all delicious. Divide the dough into 6 parts and roll out each portion on a lightly floured surface into 9 inch squares. Each strip is divided into 9 equal squares. Place 1/4 tsp of filling in each square and fold diagonally to form a triangle. Seal the edges. Hold the folded side of the triangle around the top of your index finger, and bring the two bottom points of the triangle around the bottom of your index finger and pinch together to form a little cap. Cook in a 6 or 8 quart pot of boiling salted water for 6 minutes and serve with your favorite sauce. You can also cook these in beef or chicken broth. Plunge tomatoes into boiling water for 12 seconds. Peel and chop coarsely. Heat oil in a heavy skillet over medium and add the onions and garlic. Saute and stir until onions are transparent. Add the tomatoes, salt, pepper, oregano, basil and parsley. Cook, uncovered, on low for 2 hours. Stir occasionally. Makes approximately 4 cups. No tomatoes on hand? This recipe is a keeper when you are in a hurry. In a large saucepan over medium-high, sauté the onion in oil until tender. Add garlic and sauté until brown. De-glaze the pan (scrape the bottom of the saucepan with a spatula) with the sherry; add parsley and stir.